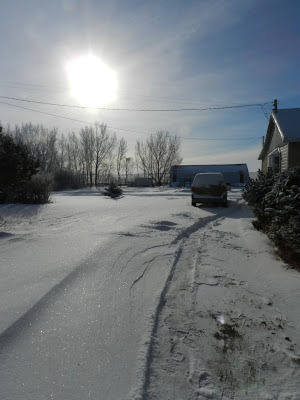 Monday's posts are for whatever is on the author's mind and up here on the Canadian Prairies at the end of January, I have to admit, I'm thinking an awful lot about snow. 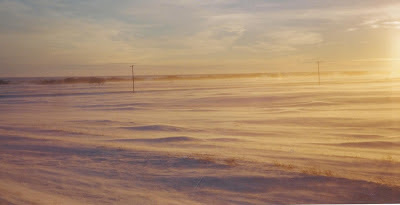 Blowing snow at ground level obliterates roads and causes white-out conditions. Snow is like money - some people have it, and some people don't. And how much you have can fall anywhere between those 2 extremes. At the moment we have so much of it that I'm sure we'll flood come spring. That's a surety considering we flooded last year with only one third of the snow we've accumulated so far and there are still 2 more months to go. But last year, someone on a loop asked about snow. What did it feel like? What size was it when it fell? How long before it melted? Did it make a sound? Do you know, I had to think about the answers. Snow is actually made up of different sizes of snowflakes, in all different patterns. Snowflakes are cold and sometimes they sting from the force of the wind. Snowflakes comes in all sizes up to about a quarter of an inch or more when they bunch together. They melt as soon as they touch your skin - unless your skin is cold, so that depends on the temperature of what the flakes touch. Tiny, snow crystals look powdery but the wind can make them feel like pins. 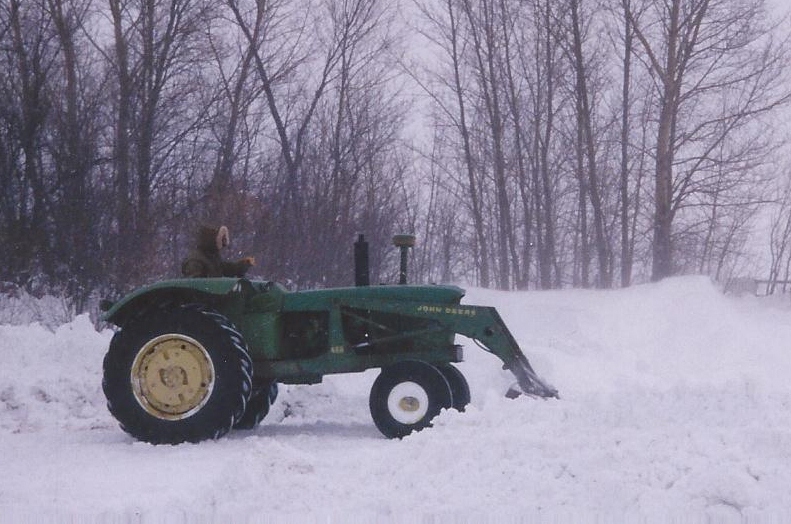 Hubby clears powdery snow by dragging a heavy tractor tire around. Snow is pushed out of the way as well as packed down creating a solid base. 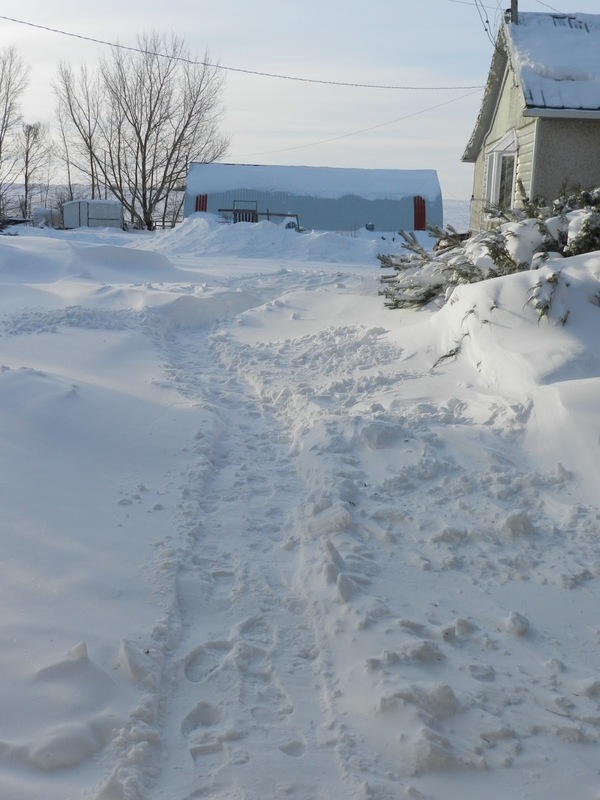 Snow drifts make chore time extra hard, especially when you sink down and get a boot-full of the cold, wet stuff. Last year, the snow between the house and my office drifted in a North-South direction. This year, the drift went Northwest-Southeast, but mainly in one spot. 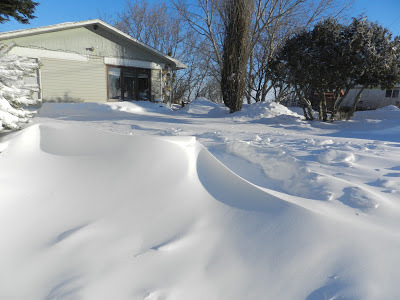 Sometimes the wind just whips the snow around in a fury. I can go to the house, then return in 30 mins and my footsteps will be covered. ...But the wind had filed it smooth and hardened it until it cracked. 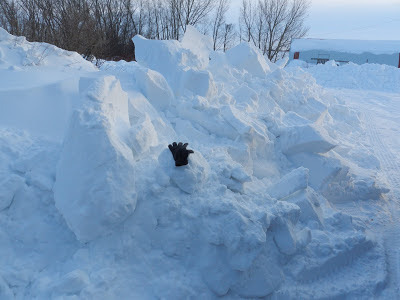 I showed it on Facebook and mentioned making an igloo. Someone asked why I didn't make one, but it was still too cold and windy out. The next day I remembered the fun I used to have making a fort. 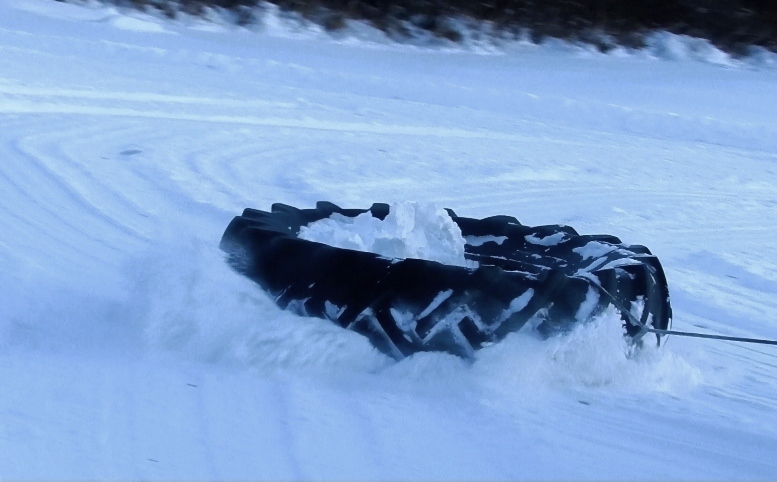 This snow was perfect for that. Here I am at 12 yrs old with my sister, Bonnie (13) and my brother Johnny (9). Yep, fort-making was a whole whack of winter fun. Look at the size of those snow chunks! They dwarf my glove. Today, I was tempted to make a fort in front of my office, but I'm behind in my writing. It was perfect weather too, with the temperature just a few degrees below the freezing/thawing point. 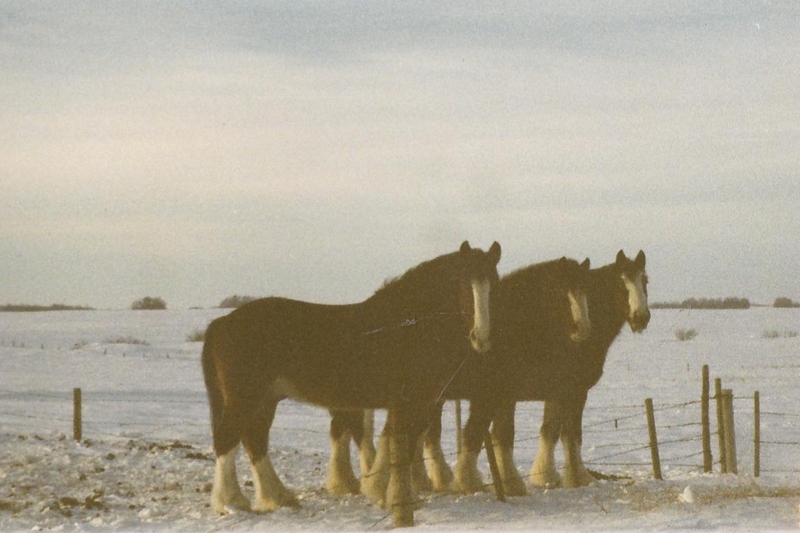 One year the snow was so hard these Clydesdales had no problem standing on it as they waited for their feed. What amazed me was that they could have stepped over that fence at any moment, but nope, they stayed put all winter. On Friday, hubby would have liked to use his John Deere 4020 to clear the snow, like he did in this photo from a few years ago, but the John Deere doesn't like starting in the cold weather. Well really... who does? So he was relegated to using the Kubota yard tractor. 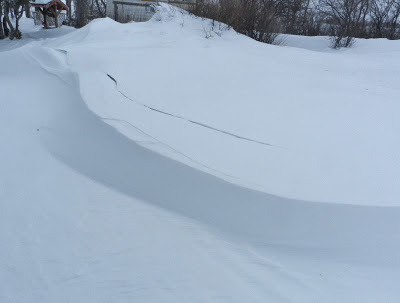 It does a decent job, but takes twice as long because the bucket isn't as big as the 4020.
another 3-4 inches of the white stuff had fallen. looks like JJ cleared my path since he's the artistic one. What's the worst storm you've ever been in? Hurricane? Twister? Sandstorm? Blizzard? What else is there? Having grown up in Colorado, I've always loved it. 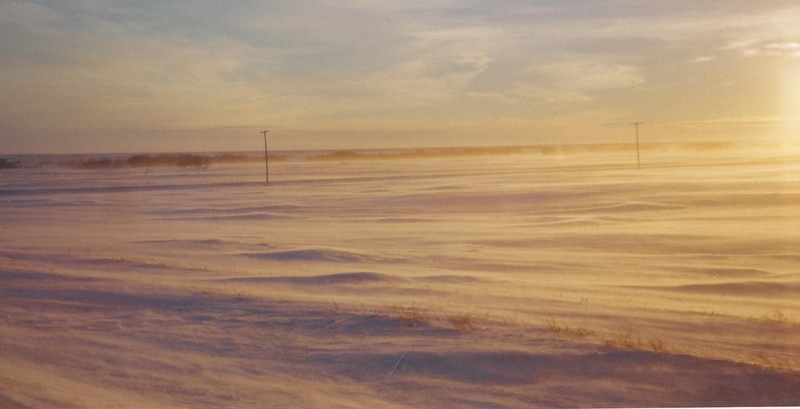 Of course, it's easy to love when the majority of the time it snowed - it had melted away after two days (on average). I also happen to really like snow/cold based athletic sports (even curling - got introduced to that when I visited Winnepeg one American Thanksgiving). 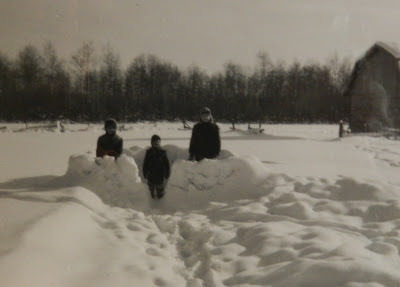 I do remember building snow forts up at my Grandparents homestead in the mountains near Evergreen. Great childhood memories. As for storms. Plenty of blizzards - including one in 1996 that shut down Denver for three days (of course, over a school break around Christmas). I've seen a few twisters, but all quite small - the kind that "jump" over things (one right over our school building). I think the worst storm was Hurricane Isabel here in Virginia - although there've been a few nor'easters around here that felt worse. Oh, i've seen a water spout when out scuba diving. Sort of a tornado over water. It was far off, but we wanted to get back into port before it changed course towards us. Still, pretty cool to see. Had snow over the weekend. My little guy couldn't wait to make a snowman. didn't work too well because the snow was too dry to pack. Still, we did manage three mini-snowmen. Unfortunately, the teens in the neighborhood kicked them to smithereens the next day. we've been having problems with kids breaking/damaging stuff in our yard lately (corner lot and kids like cutting through yard to get to their houses *sigh*). Snow was definitely the big excitement in Virginia Beach this weekend. We have very few hills, but the boys did some sledding/snowboarding on one of the few, which had very little snow because it was so crowded. I like a little snow, one or two snows a year that melt quickly, but that's plenty for me. 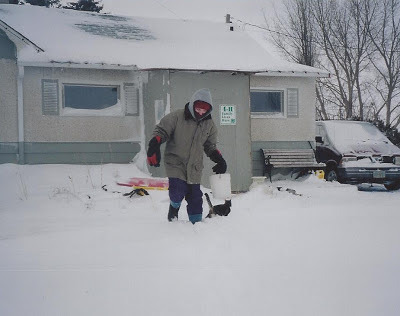 I grew up with lots of snow in Pittsburgh, and I remember it getting old really fast. Hi DebH, your comment is teeming with life, sprouting images as I imagined your experiences. How big is a water spout? My first thought was that it's like the dust devils we get out here, some of which are only 2-3 feet off the ground and kids love to follow them around - little girls with skirts especially like to chase them around. Little boys like to catch the leaves and pieces of paper that swirl around and around. But sometimes these dust devils grow huge. I was at an outdoor country music concert back in the 80's and what had been half a dozen 3' dust devils suddenly turned into a 3-4 storey monster that sent empty lawn chairs, paper cups, and reading material spinning around! And dust! What a chaos. My mom was with us and we ran for cover, but when I looked back, she hadn't followed us. We waited at the back of the area, unable to see the stage in the mayhem. People running, pushing, screaming. And then Mom emerges from the wall of dust, sauntering along with our folded lawn chairs in her hands. Smiling. LOL. Talk about an emotional roller coaster ride. Within minutes it was over. Another 30 minutes and the stage was re-set and the 80,000 people were settled in their chairs once again, albeit not in the same place. We had lost 5 rows and ended up in row 8 instead of our previous 3rd row stakeout. And I'm talking too much. Again. 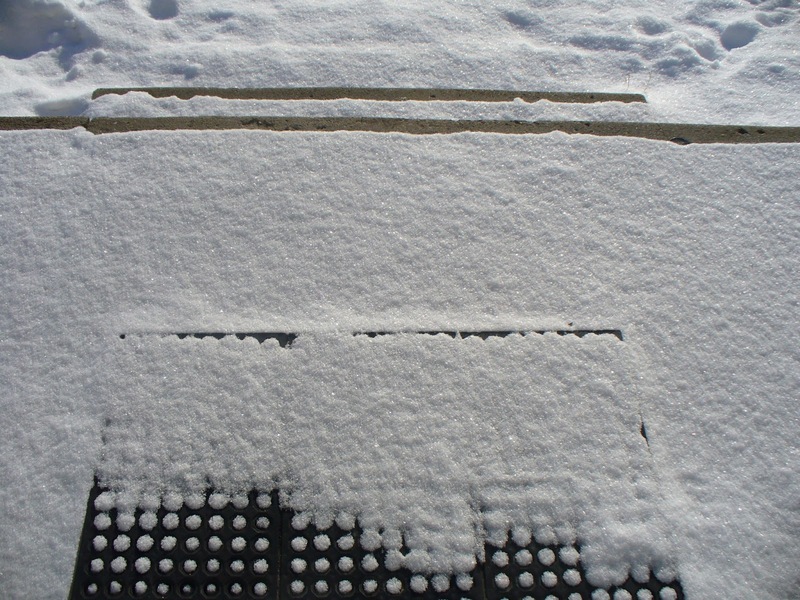 It's a wonder the kids could get their hands on sleds and snowboards. Or does wishful thinking keep them close at hand? I don't mind snow...so long as it's outside, my house is warm, and I don't have to go anywhere until it melts. Mostly though, I'm a warm weather gal. Each day when the Nelson or the kids ask if I want the heat on in my office, it's too easy to say, no, I'll stay in the house today. But I don't get as much writing done in the house because of all the distractions. And if I don't go out to my office, I wouldn't get any exercise at all. Oh, wow. It's so beautiful! I know, I'd probably hate it if I had to deal with it all the time. We don't get real snow often in Texas, though we did have a white Christmas this year (only the second one I can remember). water spouts are a bit like the dust devils you spoke of (although they do tend to be a bit larger than those small dust devils). cool to watch as long as you're far enough away. don't want to get close to big ones. Hey DeAnna, I'm glad you had a white Christmas. At least you can relate to all those Christmas cards then. Yes, the wind is what stops me from going out for walks as exercise. I could handle the cold if it wasn't for the wind chafing my cheeks and making me cry. 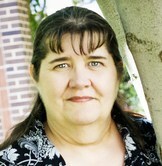 Well, I didn't know you wear contacts, DebH. I used to when I lived in Alberta, but had to stop for the same reason - they kept drying out and it was quite painful. Then again, Alberta and Colorado share much of the same physical features. 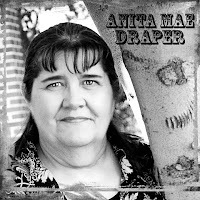 Great pictures, Anita Mae! Amazing. 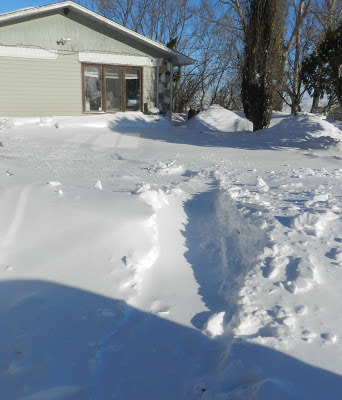 I love looking at snow, but driving/digging/shoveling isn't for sissies! I love snow but I don't like to drive in it. If I have puzzles, hot chocolate and popcorn, and I don't have to drive and I'm cozy warm - then snow would be absolutely perfect.